Dahlias are having a good year due to the summer rain. Slugs permitting my Cactus Dahlias will have given one of the best shows for several years by November when they get cut down and stored. As I expect the flower power will still be present until the first frosts in November I am going to give them a foutnightly tonic of liquid fertiliser and a further mulch. Cactus Dahlias are reputed to all derive from one plant Dahlia Juaresii brought to Europe from Mexico in 1863. After many decades of cross breeding, a Dahlia strength, we now have many forms that contain some or all of the Cactus traits. On a Cactus Dahlias the petals are narrow from tip to base and the bloom appears full. The ray florets or petals are pointed, narrow and revolute. That is they curve outward from the centre of the flower. The Semi Cactus form on the other hand has a far broader base to the petal whilst still being pointed at the tip if the petal. Deadhead as regular as clockwork. 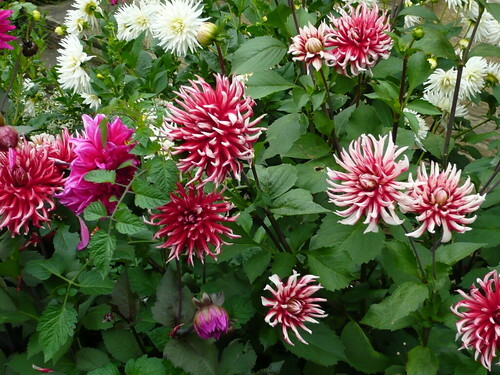 Let air circulate around Dahlias, they like there own space. To get big blooms pinch out the small side buds of your chosen bloom and any others that will take energy from your flower. Dahlias are heavy feeders so I give them a lot of compost and generous fertilser from pre-planting until they are lifted for storage.